As VIA Rail Canada struggles it survive we thought it would be interesting to return back to the 1990s. 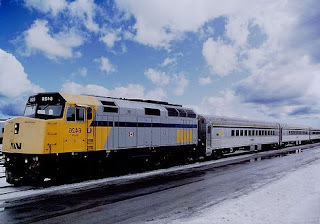 At that time there was no funding for new passenger rail cars for VIA Rail and they refurbished their 1954 built Budd stainless steel cars. They were called HEP1 cars and the work was completed by AMF. They are still in service. We found these photos in our archives of the units being rebuilt. click HERE. Also if you want the history of the HEP car refurbishment click HERE. Some years later there was a second series of Budd cars bought from various US roads; VIA equipped those with both HEP and MU pass-through lines and designated them HEP2. They're used exclusively on Corridor runs, and are identified by yellow-over-blue stripes on the letterboards, vs. blue for the HEP1s, which have HEP only. The colors derive from the color-coding of the respective receptacles.